Leave everyone mesmerized with the appeal of this Rajasthani cotton Lehenga Kurti. The aesthetically designed outfit with piping work is a perfect addition to your kids wardrobe. The neckline is adorned with matching buttons and mirror work. The flare is designed with multi-colour distinctive Sanganeri print and graced with booties all over. It has a soft elastic belt for convenient fitting on the waist. The set comes with a matching dupatta for an ultimate style. This traditional Bagru print salwar kurta set will surely make your girl look a fashionable beauty. This alluring attire is graced with floral and leafy motif all over on green base. The neckline is adorned with intricate cotton laces and sequin work. It also has a small yellow dupatta which could be easily managed by the kid. The salwar has a soft elastic belt for convenient fitting on the waist. This traditional zigzag design will surely make your girl a fashionable beauty. This attractive salwar suit is graced with multi-color Sanganeri zigzag print all over. The stylish neckline is adorned with intricate laces and sequin work. This ethnic dress is designed by creative craftsmen of Rajasthan. The luscious colours and designs showcase the Rajasthani tradition. It has a soft elastic belt for convenient fitting on the waist. Amazing combination of maroon and Yellow in traditional bandhej Lehenga will surely enhance your kids persona. This Lehenga Choli set is graced with mirror work all over. The salwar has a soft elastic belt for convenient fitting on the waist. This Lehenga is also accentuated with maroon border at the helm of flare. The set comes with a matching dupatta for an ultimate style. It is also decorated with beads work on the border of the dupatta. It is also decorated with beads work on the border of the dupatta. Amazing combination of red and coffee-brown in traditional bandhej Lehenga will surely enhance your kids persona and will make her look elegant. This Lehenga Choli set is graced with mirror work all over. This Lehenga is also accentuated with coffee-brown border at the helm of flare. The set comes with a matching double shade dupatta for an ultimate style. It is also decorated with beads work on the border of the dupatta. It is also decorated with beads work on the border of the dupatta. This traditional Bagru design cotton Dhoti Angrakha will surely add charm to your cute baby girl. The alluring Angrakha is embellished with yellow floral motif design all over. The neck and sleeves are adorned with intricate laces in Jodhpuri pattern. The sensual dhoti in yellow colour enhanced with multi-colour border. The set comes with a matching dupatta for an ultimate style. It has a soft elastic belt for convenient fitting on the waist. Leave everyone mesmerized with the appeal of this Rajasthani Bagru design cotton Lehenga Kurti. 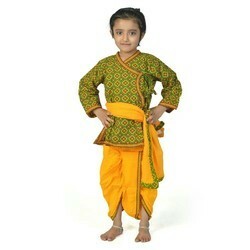 This aesthetically designed outfit with ethnic piping work is a perfect addition in your kids wardrobe. The beauty of this attire is intricate print all over on Kurti and Lehenga. The neckline is adorned with matching buttons and mirror work. It has a soft elastic belt for convenient fitting on the waist. The set comes with a matching dupatta for an ultimate style. This traditional Bagru designer cotton salwar kurti will surely make your girl a fashionable beauty. This stylish designed outfit is graced with detailed floral motif in luscious colours on red base. The neckline is embellished with intricate cotton laces and sequin work design for an ethnic appearance. It has a soft elastic belt for convenient fitting on the waist. 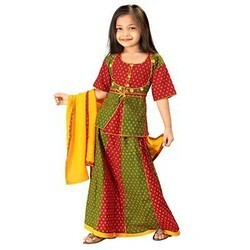 This traditional Bagru print designer cotton salwar kurta will surely make your little girl look a fashionable beauty. This stylishly designed outfit is graced with detailed floral motif in luscious colours on black base. The neckline is embellished with intricate cotton laces and sequin work design to look ethnic. It is finished with a yellow drape. The salwar has a soft elastic belt for convenient fitting on the waist. This traditional Bagru design will surely make your girl a fashionable beauty. This alluring attire is graced with floral and leafy motif on green base all over on kurti and salwar. The neckline is adorned with intricate cotton laces and sequin work. It has a soft elastic belt for convenient fitting on the waist. This traditional Bagru design cotton Dhoti Angrakha will surely add charm to your cute baby girl. The alluring Angrakha is embellished with colouful floral bootie motif design all over on red base. The neck and sleeves are adorned with intricate laces in Jodhpuri pattern. The sensual dhoti in white colour enhanced with multicolour border. It has a soft elastic belt for convenient fitting on the waist. Amazing combination of orange and turquoise in traditional bandhej Lehenga is very unique in itself. It will surely enhance your kids persona. This Lehenga Choli set is graced with mirror work all over. The salwar has a soft elastic belt for convenient fitting on the waist. This Lehenga is also accentuated with blue border at the helm of flare. The set comes with a matching dupatta for an ultimate style. It is also decorated with beads work on the border of the dupatta. It is also decorated with beads work on the border of the dupatta. The very pretty kids Lehenga in unique combination is a perfect pick for your little girl. Amazing combination of blue and turquoise in traditional bandhej Lehenga will surely enhance your kids persona. This Lehenga Choli set is graced with mirror work all over. The salwar has a soft elastic belt for convenient fitting on the waist. This Lehenga is also accentuated with blue border at the helm of flare. The set comes with a matching dupatta for an ultimate style. It is also decorated with beads work on the border of the dupatta. It is also decorated with beads work on the border of the dupatta. Be a style statement in this cotton Rajasthani multi designer Lehenga Kurti. The beauty of this outfit is adornment at neckline with mirror and piping work. This Lehenga Kurti set is graced with zigzag Sanganeri design over all. The Lehenga is enhanced with matching piping for a drastic look. It has a soft elastic belt for convenient fitting on the waist. The set comes with a matching dupatta for an ultimate style. This lovely Sanganeri multi-colour Lehenga Kurti will surely enhance your girls persona. This unique pattern outfit is graced with pure Sanganeri bootie print in luscious colours. The neckline is adorned with mirror work gives it a mesmerizing glance. This attire is trimmed with yellow piping work all over on Kurti and Lehenga. It has a soft elastic belt for convenient fitting on the waist. The set comes with a matching dupatta for an ultimate style. Leave everyone mesmerized with the appeal of this Rajasthani cotton Lehenga Kurti. This aesthetically designed outfit is graced with Sanganeri booties all over on red and green base. The alluring Kurti is adorned with designer neck and mirror work with yellow pipping. It has a soft elastic belt for convenient fitting on the waist. The set comes with a matching dupatta for an ultimate style. Amazing combination of red and yellow in traditional Sanganeri design will surely enhance your kids persona. This Lehenga Kurti set is graced with mirror work all over. This pretty attire is trimmed with red piping work all over the front, neck, sleeves and bottom. It has a soft elastic belt for convenient fitting on the waist. This Lehenga is also accentuated with red border at the hem of flare. The set comes with a matching dupatta for an ultimate style. 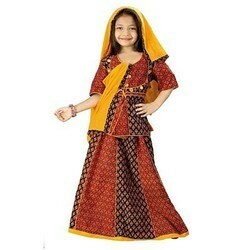 The ethnic yellow motif print over black base salwar kurta set will make your little girl look like a little princess. The neckline and the drape is embellished with intricate cotton laces. The neckline also has sequin work design for an ethnic appearance. The salwar has a soft elastic belt for convenient fitting on the waist. This Bagru print designer cotton salwar kurta is a perfect first attempt to introduce your little girl to Rajasthani tradition. This stylishly designed outfit is graced with detailed floral motif in luscious colours on red base. The neckline and yellow drape is embellished with intricate cotton laces and sequin work design for an ethnic appearance. The salwar has a soft elastic belt for convenient fitting on the waist. The enhancement is to make to attire comfortable for the kid. This traditional Bagru print designer cotton salwar kurti will surely make your girl a graceful fashionable beauty. This stylishly designed outfit is graced with red traditional bootie motif print on black base. The neckline is embellished with intricate cotton laces and sequin work design for an ethnic appearance. The salwar has a soft elastic belt for convenient fitting on the waist. The set also contains a matching dupatta with lace all around the border. Try this designer traditional Bagru print cotton salwar kurti to make your little one look diverse from others of her age. This fashionably designed outfit is graced with orange bootie print on red base. The neckline and the drape is embellished with intricate cotton laces. Neckline also has sequin work designed for an ethnic appearance. The salwar has a soft elastic belt for convenient fitting on the waist. The pure cotton traditional Rajasthani Bagru print salwar kurta set is a must buy this summer. The zigzag print in vibrant colors makes it look very attractive. 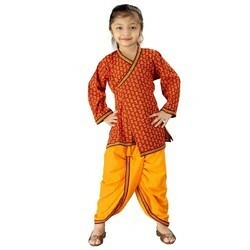 The salwar has a soft elastic belt for convenient fitting on the waist. 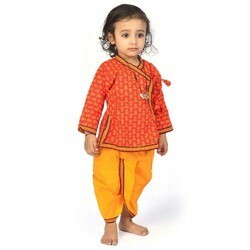 This traditional Bagru design cotton Dhoti Angrakha will surely add charm to your cute baby girl. The alluring Angrakha is embellished with yellow floral motif design all over. The neck and sleeves are adorned with intricate laces in Jodhpuri pattern. The sensual dhoti in yellow colour is enhanced with multi-colour border. It has a soft elastic belt for convenient fitting on the waist. 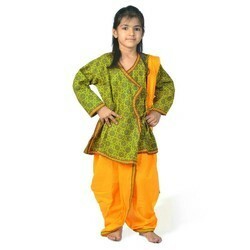 Amazing combination of green and yellow in traditional Sanganeri design will surely enhance your kids persona. 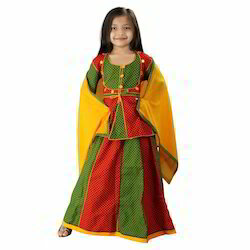 It will make your little one look like a Rajasthani princess. This Lehenga Choli set is graced with mirror work all over. 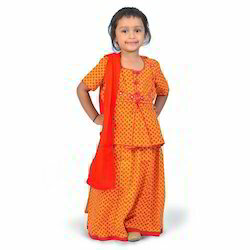 The salwar has a soft elastic belt for convenient fitting on the waist. This Lehenga is also accentuated with green border at the helm of flare. The set comes with a matching dupatta for an ultimate style. It is also decorated with beads work on the border of the dupatta. It is also decorated with beads work on the border of the dupatta. Amazing combination of red and yellow in traditional Sanganeri design will surely enhance your kids persona. This Lehenga Choli set is graced with mirror work all over. This Lehenga is also accentuated with red border at the helm of flare. The set comes with a matching dupatta in double shades for an ultimate style. It is also decorated with beads work on the border of the dupatta.